Many flowers have graced the skin of tattoo enthusiasts, but none have been quite as popular as the rose, and that includes tribal rose tattoos. "Would a rose by any other name smell as sweet?" For thousands of years, the rose has been a symbol of beauty and perfection that has been revered by poets and other authors alike. William Shakespeare would not have written this famous line about a lesser flower; the beauty of the rose is what makes the line sing. Roses are a flower that grows on the shrub Rosa, and there are more than a hundred species of wild roses that exist on Earth. Additionally, there are many more species that have been cultivated for their attributes. There are many different colors of roses, from red, to pink, to white, and nearly any other shade you can think of. In fact, the only color of rose that has not yet been developed is the blue rose, and science is still working on that one. The roses that we often see today in our gardens and in the florists' shops are not much like the original wild roses of the past. Most of today's roses were bred for their colors and longevity, so many have lost their natural beautiful scent and any imperfections. The rose has not only been popular in prose and poetry - many other artists have used this flower as inspiration for their creations. Even perfumers, entranced by the scent of this silky-petaled bud, are known to spend their lives trying to capture the beautiful and natural scent of roses. Some painters spend years trying to capture the beauty of a single type of rose or stage in the rose's life. As a sacred homage to several goddesses (including the Egyptian Isis and the Roman Aphrodite), many artists included these flowers in images portraying the fair ladies. Roses also play a large part in Christian culture, even in Christian themed tattoos. The rose, especially the rose bud or the pure white rose, is a popular symbol of the Virgin Mary. Catholics often dedicate these flowers to the Virgin Mary during special Masses and other religious occasions. Roses have also often played roles in the wooing of women. For many women, a rose (or a dozen roses) is definitely the way to their heart. Red roses symbolize the passion that a suitor feels for the recipient, while red and white can represent both passion and long lasting love. The ideal of a perfect rose, whether in real life and flower form, or in an artistic manner, is one that many people spend a lifetime looking for. 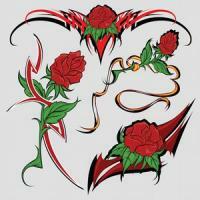 Many people choose roses for at least part of, if not all, of the image for their tattoo. The rose's reputation for love, purity and beauty make it a popular image for women who wish to convey these sentiments in their body art. 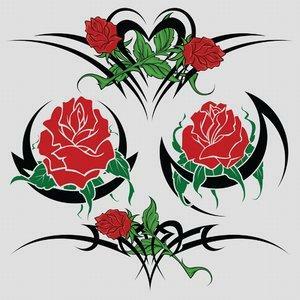 Tribal rose tattoos add a twist to this rose artwork that can make the tat different from the typical rose. Tribal rose tattoos can be inked in all black, or they may include a colored rose with black tribal work surrounding the blossom. This tribal work can be intricate, or the dark lines can stand as a harsh contrast to the delicate rose.